I’m at Twitter’s headquarters in the South Park neighborhood in San Francisco chatting with the team, who just got funded by a group of investors. You can read all about it on TechMeme. 1) Every employee here has an iPhone. Hint: recruiting ploy. What would you rather have? Free meals at Google or a cool cell phone? Heheh. 3) The scaling issues that Twitter had after the SXSW conference (the site was slow, often unavailable, etc) are now mostly behind them (although the home page is still a bit slow for me, but that has something to do with the thousands of icons on my Twitter page. The team tells me their architecture is now “horizontally scalable” which they explained meant that they could just throw more hardware at any problem that comes up from now on. 4) No new features to announce yet, but they say they’re working hard on a “slew of stuff” coming soon. 6) Co-founder Evan Williams is getting married tomorrow. Congrats! 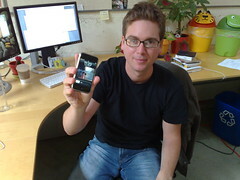 Here’s Biz Stone, co-founder of Twitter holding his iPhone. I would like to be paid good so that I can get whtever I want [:D] !! Isnt twitter similar to the status update of facebook? Sorry but if a company is going to go through the bother of feeding me well I am more likely to join and stay. But then again I am a bit of a foodie so I am biased. I would much rather have a good consistent meal then any tech gadget. I have too many as it is and I purging my stuff right now as we speak. 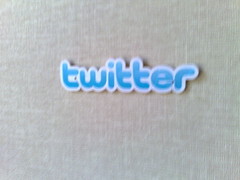 Good bit of information about Twitter as I am current writing an informative piece about micro-blogging for my web site but I already have an iPhone, I love it but I have to admit I would be a sucker for a company that provided free meals. Nothing beats saving time by not having to worry about packing a lunch of dealing with too many unhealthy choices, waiting in line or tipping, etc. I get fed really well at my job, have a kicking computer and phone, and great benefits! What more could I want! To work for a company with the name Twit for the first for letters of iss name? Umm…nah…Google is where the money is at! Anyone else have the urge to sock anyone that holds up an iPhone as if to say, “Look at me! I’m in the cool rich geek club too! !” right in the mouth? I find it hard to believe that you can do that without choking, but I can certainly understand your preoccupation with consistent meals. Definitely a cell phone, lol. …and they said there may never be a meaningful or relevant use for Twitter? Thanks Robert, for your continuing evangelism of all things digital. All these comments about “I’d prefer the meals”… Free meals at work is in the company’s interest – it keeps all those single folks on-campus. Good food is a no-brainer. Gadgets come and go. That’s pretty cool that you got to visit the twitter-cave. I am still getting used to using twitter and figuring out the best way to make it useful for me. It’s nice to know that Twitter is in fact looking towards the future. They have a crazy amount of users and I think they will really blow up if they can increase the functionality of the tool. Can’t wait to see what they are going to come out with. I might have to submit a resume to them if they are giving out IPhones. I still havent gotten one yet and I don’t know if I want to drop that much on a phone. Good article. Will be waiting to see any future twitter articles that talk about what they are actually working on.